In 2015 one million refugees fled to Europe, and in 2016 Europe seemed to stop caring. Denmark passed a controversial law that allowed authorities to seize valuables and cash from refugees. Bulgaria’s police awarded an illegal volunteer force of ‘refugee hunters’ who detain refugees crossing their borders. Hungary built borders against their Serbian neighbours. In 2017 the UK ended their commitment to child refugees and newly elected US President Donald Trump banned migrants from 7 countries. Portrayed as either the victims or the villains. From one media extreme of distressed children to an entirely different extreme of accusations of terrorism. Refugees have lost their identity. In the years of crisis and media manipulation, refugees have been confused with migrants who leave their country for economic benefits. This difference between a migrant and a refugee is clear from the definition of a refugee: “a person who has been forced to leave their country”. These are human beings, ranging from students to doctors to husbands, sisters, human beings, all with their own identity and their own lives that they have had to leave behind. Europe faced a similar refugee crisis following the second world war, something we too easily forget. And from victims they have become villains. Media reports claimed the attacks across Europe were all orchestrated by refugees, and these reports almost immediately followed the attack with little evidence to back it up. Notably the December attack in Berlin was by an asylum seeker, which allowed the media and Merkel’s political opposition to demonise refugees. But this is entirely unrepresentative of refugees. Paris, Niece and Brussels were all devastated by terrorist attacks but they all shared one thing in common – they weren’t by refugees. Perhaps all this media manipulation has just caused one massive dose of apathy. After being shocked and saddened by heart-breaking photos of war, we have become desensitised to shocking material. We disconnect from the reality which allows for politicians to so gladly sweep it under the curtain and remind us of our domestic problems. Although we face domestic problems, it does not excuse the brutalities of the Assad regime. We have more refugees now since World War Two. Refugees aren’t limited to Syria, despite media attention which makes it appear so. War and famine is crippling South Sudan, Somalia continues to be a failed state, crisis continues in Afghanistan and Iraq, civilians in Eritrea are fleeing from conscription and poverty, and the Rohingya, a Muslim minority in Myanmar, are facing serious risk of a genocide. 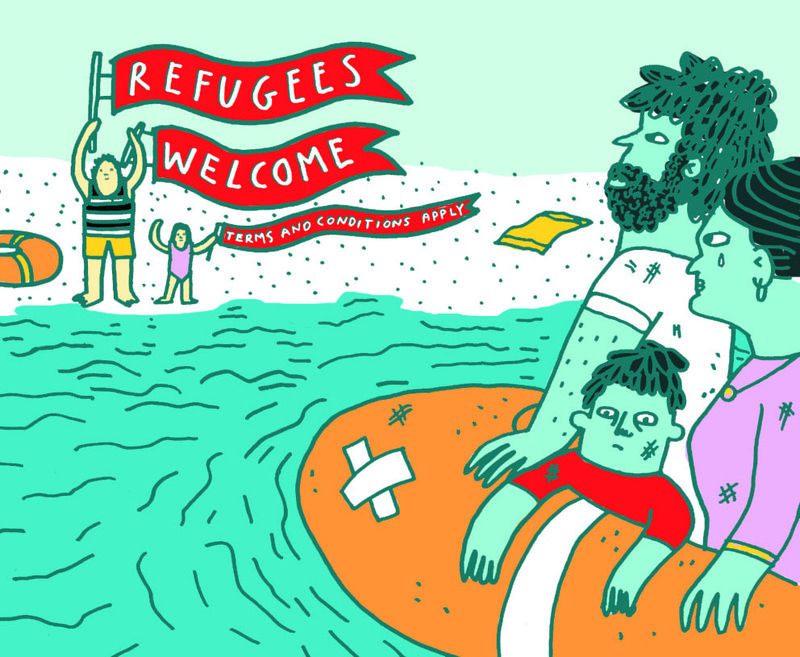 The vast majority of refugees do not go to wealthy countries. Refugees do not have the resources to get to a rich country and tend to settle in the first country they can get to. This results in poorer countries being forced to fit the bill of the refugees. Turkey currently hosts 2.5 million Syrians, the most of any country. And when they do try and get to Western Europe they are putting themselves in danger. Refugees crossing the Mediterranean often travel in dinghies. Between January and October 2016 roughly 3,800 migrants died crossing. Even when on land, refugees risk their lives crossing borders in the back of suffocating trucks, from inhumane living conditions, and at the hands of those who want to exploit them. One problem with the Western world is that it is consistently concerned by its own problems, but this shouldn’t come at the cost of disregarding the millions of persecuted people. As the crisis continues, risk of displacement, exploitation, life and death are at the hands of the ordinary citizens of the western world. It’s time to demand more, to remember that every human has the same rights and deserves a chance to live free of persecution and with the same opportunities as any other human being.